Opening Prayer: God our Father, in obedience to you, your only Son Jesus Christ accepted death on the cross for the salvation of humankind. We acknowledge the mystery of the cross on earth. May we receive the gift of redemption in heaven. . We ask this through Christ our Lord. Amen. Matt. 8: 5-13 Many will come from east and west and find a place at the banquet in the kingdom of God. Reflection: Christian faith, modelled upon the love of God as manifest in the Sacred Heart of Jesus, a Heart of love, says that we are all brothers and sisters. It affirms that our love must be universal, extended to all, and not only to my own, to my kin, and my group. In one of the most challenging passages of the Bible, we are given a new command of Jesus: love your enemies; pray for your persecutors (Mt. 5:44). Jesus then explains that his heavenly Father shows this universal love, a love that extends even to one’s enemies: His sun rises on the bad and the good, he rains on the just and the unjust (Mt. 5:45). In the Jewish tradition there is a saying: if two persons claim your help, and one is your enemy, help him first. We, as followers of Jesus Christ, are to be instruments of God’s love. God’s love is universal, and so our love cannot, should not be anything less than universal, extending to all of God’s children. 1. Think of a particular person, or a particular group of persons that you find it very hard to love. Pray to God for help to learn how to love that person or group. 2. Take a page of paper and write out on it the names of friends, relatives, co-workers, that you would like to pray for. 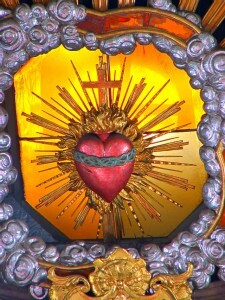 Resolve every few days to read over that page, and entrust all those persons to the love of the Sacred Heart. 3. Pray regularly for the progress of the ecumenical movement, for unity among all God’s people, that they may be one.